Note: This Dust of the Master is a revised and updated version of an article from three years ago. Click here to read Part 1. 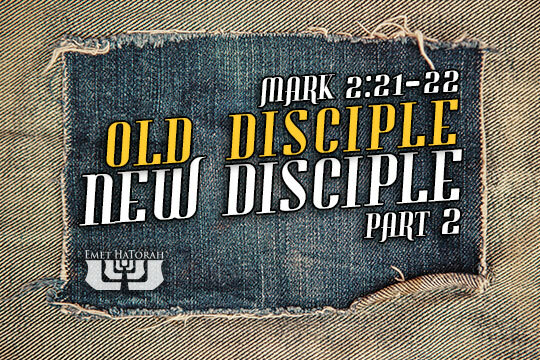 In Part 1 of “Old Disciples, New Disciples,” we took note of how the historical and cultural context give us insights into Yeshua’s parables of the Torn Garment and the Wine Skins. In Part 2 we will take a look at the popular interpretation of these parables and see if it is congruent with Yeshua’s other teachings. But this interpretation has several problems. The first is that this interpretation is anachronistic. Christianity as a separate religion did not exist during the lifetime of either Yeshua or the Apostles. It wasn’t until the late second century that Christianity was considered a religion distinct from Judaism. Until that time, Christianity was simply a sect, a denomination, with Judaism. Neither Yeshua, nor his disciples, ever intended to create a new religion apart from the biblical expression of Judaism. They all practiced Judaism, not Christianity. To interpret Yeshua’s parables to contrast Judaism with a religion that didn’t yet exist does not hold up to scrutiny. This interpretation only arose after the solidification of Christianity into a religion divorced from Judaism, a process which took nearly two centuries to complete. Second, why would Yeshua, the Messiah of Israel, be introducing a new religion to the Children of Israel who were strictly forbidden from adopting new religions? Deuteronomy 13 specifically condemns any attempt to “leave the way in which the LORD your God commanded you to walk” (Deuteronomy 13:5). This is why Judaism has traditionally rejected Christian evangelism. The Children of Israel are commanded to reject anyone who would lead them away from the ways of their forefathers, even if it is a prophet demonstrating signs and wonders. They are to reject that prophet, because “the LORD your God is testing you, to know whether you love the LORD your God with all your heart and with all your soul” (Deuteronomy 13:3). Again, Yeshua was not introducing Christianity in these parables. In summary, Yeshua and his disciples operated completely within the framework of Judaism. Yeshua never intended on creating a new religion, especially one that would be contrasted against the religion he himself practiced. Obviously, our traditional interpretation fails on many levels. But if this is not the correct interpretation, then how should we understand these parables? In Part 3 of our series we will explore some parallels to Yeshua’s teachings found in rabbinic texts. We will see how intertextual comparisons between the Apostolic Scriptures and other early Jewish sources can help us better understand Yeshua’s intent in these parables. This process of comparison will then allow us to begin understanding Yeshua’s teachings from a perspective within Judaism, rather than outside of it.